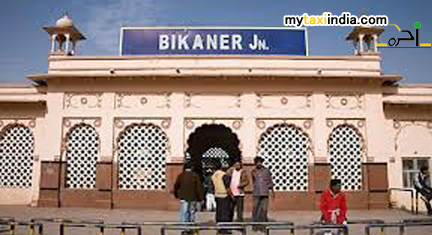 Bikaner Junction is a major railway station serving the city of Bikaner, Rajasthan state, in India. The station connects Bikaner with various other cities and towns of the Rajasthan and major cities in Northern India. Bikaner is a beautiful city in Rajasthan state of India. It is widely celebrated by tourists for its historical importance, magnificent forts, graceful havelis, and many acres of white sand, and travel attractions. The Junagarh Fort built way back in the 16th century is one of the best tourist attractions of the city. Interestingly, the fort has never been conquered. The museum within the fort houses priceless collection of miniature paintings dating back to many centuries. Lalgarh Palace is another major tourist attraction of the city. Built and designed way back 90 years back by Sir Swinton Jacob is now converted into a luxury hotel. The Ganga Golden Jubilee Museum houses many amazing specimens of Harappan civilization, the Kushan, and Gupta era. Shiv Bari Temple is a fabulous attraction of Bikaner city. It is dedicated to Lord Shiva and built with high walls by Maharaja Doongar Singh in the 9th century. Prachina Museum established by the daughter of Maharaja in the year 2000. The museum of Bikaner is of special importance to people who take special interest in art and crafts. Ganga Golden Jubilee Museum is a must visit for all tourists across the globe. It was established by Maharaja Ganga Singh in the year 1937. It is home to renowned collections of history, artwork and sculptures. Sadal Museum is situated right in the upper storey of Lalgarh Palace. You would simply love to view amazing Georgian paintings, rare artifacts, etc. Gajner Wildlife Sanctuary is a must visit for adventure lovers. It used to be a favourite site of hunting for Maharajah of Bikaner. Other fabulous tourist sites in the Bikaner include Deshnok Temple, Laxmi Nath Temple, Prachina Museum, Kote Gate, Jain Temple Bhandasar, and many more. Bikaner is a historical city and a must visit for tour lovers. In case, you have been looking forward to visit the city in the near future, My Taxi India would help you create some amazing memories to cherish for a lifetime. Our well trained and experienced chauffeurs will be at the appointed place and time the moment you book our services. With us, it is all about enjoying the most amazing travel experience. All you need to do is book a taxi online with us and enjoy the magnificence of the city with your loved ones and family. We will take care of all arrangements for corporate and leisure tours as per your specific tour requirements.